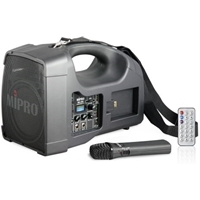 Mipro MA202B Personal Wireless 56w PA System - Price does not include ACT-222T handheld mic, picture as example only. Please see "related products" tab to add mic. The MA-202 is the flagship of personal wireless PA systems. This powerful system boasts versatile feature such as built-in convenient storage compartment and battery charger for ACT-222T handheld transmitter microphone. Lightweight, robust and battery operated, it is an ideal public address solution for small to medium crowds. Culmination of personal wireless PA designs. Optional ACT-30H handheld transmitter for improved sound quality. Convenient storage compartment and battery charger for ACT-222T handheld microphone.